What's the significance of a place name, and how does a name reflect its surroundings? While the very name 'Marbella' resonates around the world - many will recognise the Hollywood-style road signs dotted around Marbella and neighbouring towns like Estepona and Mijas. These really are signs of the times. Familiar features on the Costa landscape, international status symbols, a single name summing up an entire district. It's now 25 years since the large, white capital letters were copied by Gil era town hall officials with the 'MARBELLA' ones cropping up around various districts in 1993, commanding as much attention for their striking visual statement as the town's reputation itself. 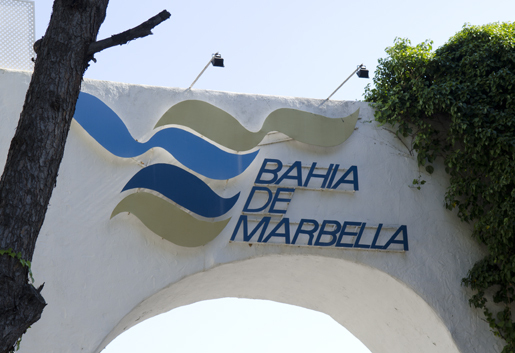 And how many of us have spotted the 'BAHIA DE MARBELLA' sign driving past Hospital Costa del Sol? Behind this sign, hidden from view, lies a long stretch of sand dunes and a housing complex described in gushing terms by its residents as "the most prestigious urbanisation in Marbella." Local writer Chris Dove has given the area an unofficial makeover using its English translation to create new name, 'MARBELLA BAY'. The name bay conjures up positive images although in the strict geographic sense Marbella does not lie in a bay but a long gently inward sloping stretch of coastline. "'Marbella Bay' is easier for foreigners to pronounce, it's instantly recognisable, memorable, and has a nice, modern ring to it. The beach is called Playa Alicate and is surprisingly popular in the summer. The outstanding feature is a 30 to 50m wide strip of sand dunes abiout 2 to 4 m high and running for 1000m at the back of the beach. This dune area is located between the Realejo stream and the Los Monteros residential development. It was saved from destruction in 2004 by the Pro Dunas Association. It was the first dune environment in Marbella to be protected. In 2015 the dunes were one of nine along the Marbella Coast to be protected as a nature reserve by declaration as "Ecological Reserve - Dunas de Marbella" by the regional government. .
Bahia de Marbella is a mixed residential community comprising 66 single homes, terraced houses, apartments and penthouses. The community was actually first established in 1995 with a few properties and expanded from 2000 to 2006. Jóse Conejo Guerra was estate manager in this time and José Conejo Guerra y Asociados are the current administrators. José's oversight of the complex coincided with the work of respected Peruvian architect Leonor Mármol Vásquez and her son, Málaga-based architect Manuel Navarro Mármol. The pair left their mark on one property on the estate, drawing on classic Spanish styles and features chosen for the home of a retired Johnson & Johnson director and his wife. Construction began in 1997 and was completed in 1999, fulfilling the German couple's wish to move to Marbella at the turn of the new millennium. The location of the property in Bahía de Marbella is one of the main characteristics of this house. Designed to obtain the maximum orientation towards the South, and situated in a back-facing cul-de-sac. Proximity to the coast's general Costa del Sol Hospital is an interesting feature and so are the golf courses of Rio Real Golf, Santa Clara Golf and Marbella Golf and Country Club, which are only minutes away. There is still ongoing work to be done on the complex. The main entrance has not been finished, and some green spaces have yet to be completed." Architect Manuel continues to lead emblematic projects, including the ornamental lighting and greening of central Marbella and the Rehabilitation of Los Baños del Carmen, the historic seafront site in Malaga City. Bahia de Marbella is a luxury urbanisation just east of Marbella.